So I was meant to post this recipe about 2 weeks ago, then I ended up getting the flu which turned into LARYNGITIS so I was basically sleeping all week. (Side note: losing my voice for a week made me realise how hard it is to live your life when you can’t speak. Like calling up a GP to make an appointment? Not an option. I ended up carrying a notepad into the surgery with me so I could make an appointment because I could barely even whisper. Nightmare). Then I had to catch up with all the uni I’d missed plus prepare for a group presentation we had on Friday. And now we’re here, a fortnight later, with these heavenly bites. I remember the first time I’d made millionaire’s shortbread. It’s quite an easy recipe to make so it was one of the first things I’d made from a recipe I’d found myself. 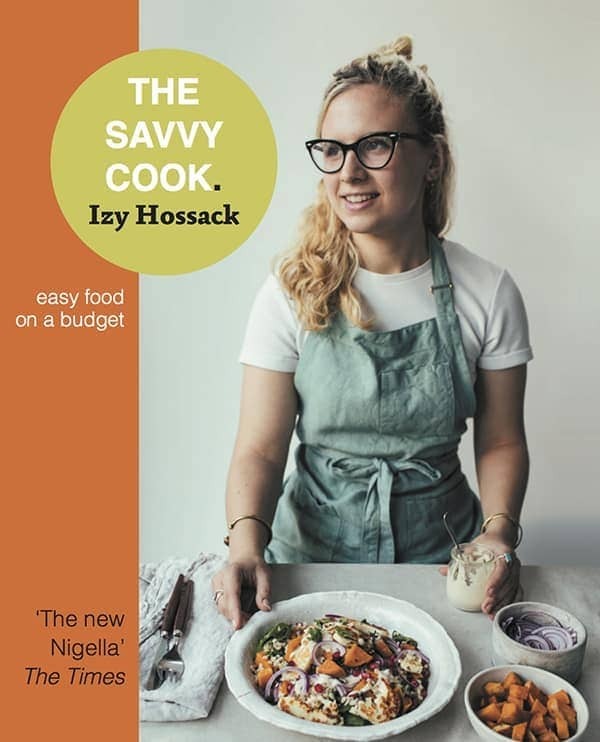 I’d taken the cookbook out of my school library and photocopied a bunch of things I wanted to make. After trying the shortbread out they became a favourite of mine and my brother’s for a while. I hadn’t made them again in years but you know when you just get a very strong craving for something and you can’t stop thinking about it? Yeah that happened with these. Except this time I wanted a salty twist so I turned to pretzels (bonus = that extra crunch) and malted milk powder which has that salty twang to it. 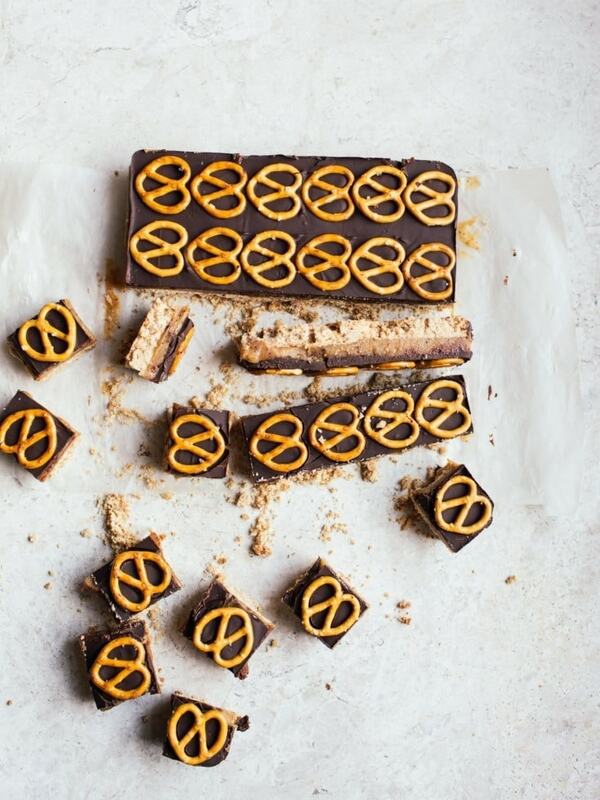 Now I bet you can guess that a shortbread + caramel + chocolate concoction is gonna be rich af. 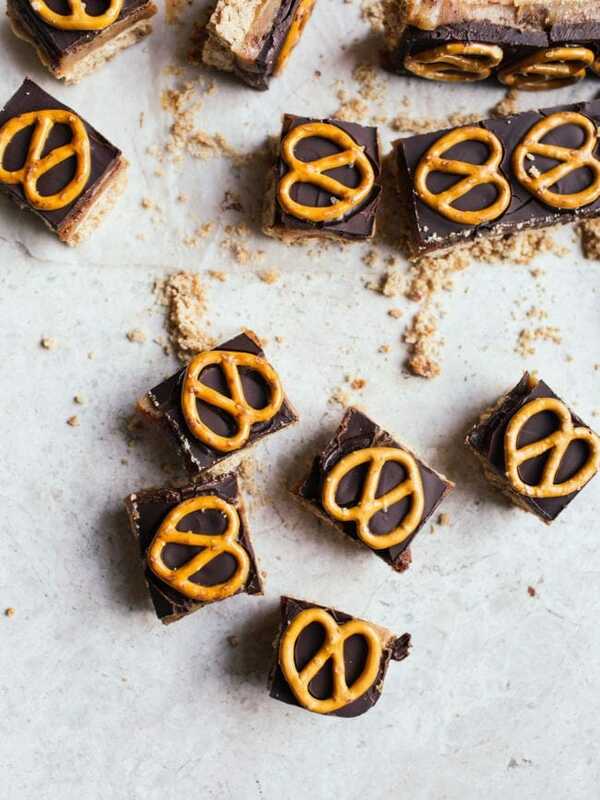 I cut them into lots of little squares for this reason (which is also very aesthetically pleasing as you get a pretzel on the top of each bite). One thing to note is that unless you’re gonna eat them within 2 days, the pretzels will start to go stale. 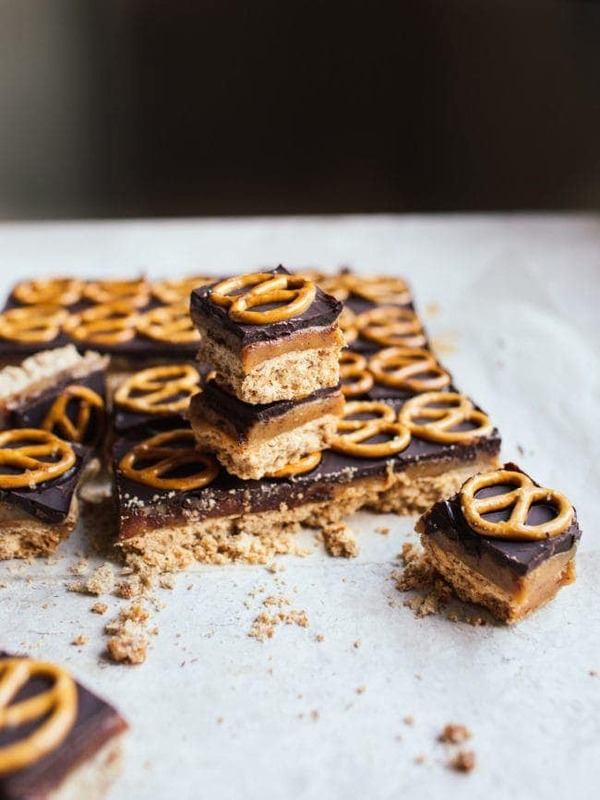 So if you’re making these to eat through the week I would advise pressing the pretzels into the caramel and then pouring the chocolate over the top to protect them for longer. Preheat the oven to 180 C (350 F). Line a 20cm (8-inch) square baking tin with baking paper. Place the flour, sugar and butter into a large bowl. Use your fingertips to rub the butter into the dry ingredients until you get a mealy texture. Add the crushed pretzels and mix through into the mixture. Tip into the lined baking tin, spread it out in an even layer, then press down to make a smooth, even base. Bake for 15-20 minutes - until the top start to colour golden. Remove from the oven and set aside. While the base is baking, combine the caramel ingredients (sweetened condensed milk, butter, sugar, malted milk powder) in a medium pot. Place over a low heat and stir constantly (I like to use a silicone spatula) until the butter has melted. Turn the heat up and bring to the boil - keep stirring and cooking until the mixture has thickened and darkened slightly. Pour the warm caramel over the cooked shortbread base and spread out in an even layer. Set aside to cool completely. Once the caramel has cooled, pour the melted chocolate over it and spread out in an even layer. 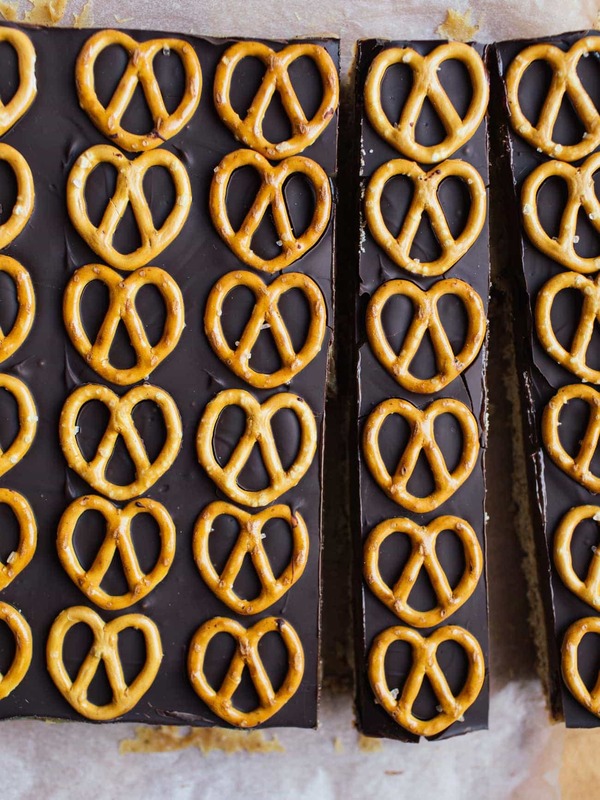 Decorate with the pretzels (I managed to fit a grid of 5 x 6 on but it'll depend on the size of your pretzels). Leave to cool and set before cutting into squares with a hot knife. I hope you fully recovered? I often have these absurd cravings when I am sick. 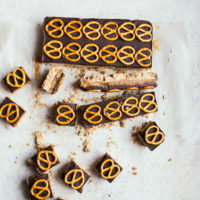 These bites look perfect, will need to try them! Very creative. I didn’t think the pretzels would work but then saw the picture and they look cute. With malted milk powder and condensed milk, this looks like a delight. These are the perfect item for our community Christmas bazaar to help us raise money to give Christmas food baskets to the needy. Everyone of every age will love these! Thank you so much for the recipe! I just wanted to say I’m in an Izy (ha!) mood lately – making anything from this site+ the books. And for now I’m not even tired of this, and these guys are going to be the next ones, I think. Oh, I forgot (why we can’t have an editing feature in websites?so useful). Can I send you an email? I don’t expect you to replay immediately, I know you’re super busy – but I would like to ask you some questions about studying in your field in the UK as international student. So if you’re OK with that, I’ll send you a short email. Wow! This look so yummy. Will definitely try it out.